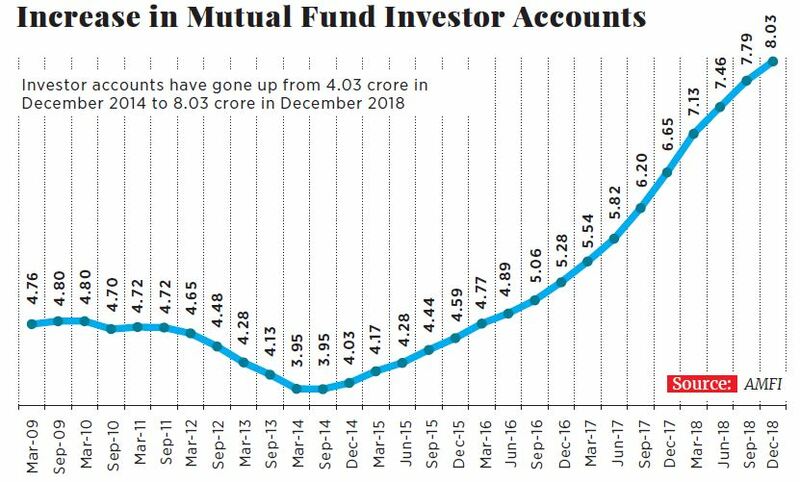 Inflows into mutual funds through SIPs, which let individuals invest in the markets with a steady fixed amount rather than a lump sum, thus averaging out the volatility and therefore the risk, have been steadily growing since 2014. 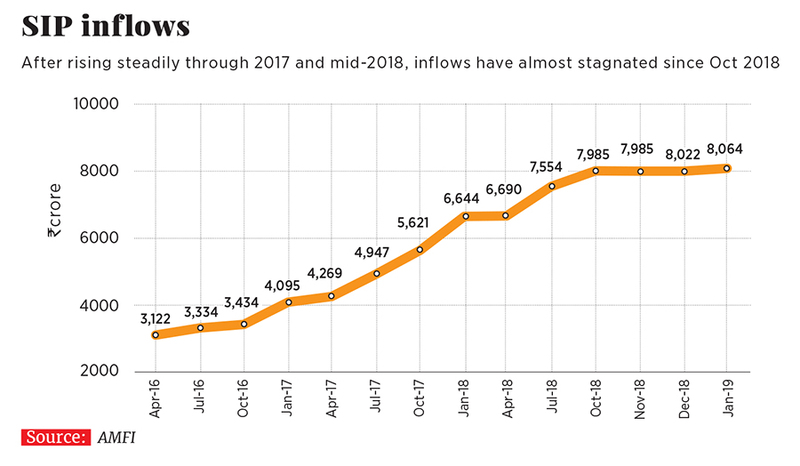 From ₹1,200 crore in June 2014, SIP inflows have grown almost eight-fold to ₹8,094.82 in February 2019. But, as with any market downturn, investors seem to be wondering if they made the right call. And though the inflows continue to grow, the pace of growth has slowed to 0.5 percent per month from around 5 percent last year. Though SIPs as an investment tool have been around for many years, total equity inflows grew and peaked in September 2017 on the back of demonetisation and a push by the industry to popularise mutual funds. “The industry started promoting SIP as a way of investing in mutual funds [MFs] as a concept. And since 2014, and when the Association of Mutual Funds in India [AMFI] started spending on the ‘Mutual Fund Sahi Hai’ campaign, on the SIP way of investing, we have gained momentum,” says A Balasubramanian, chief executive officer, Aditya Birla Sun Life AMC. 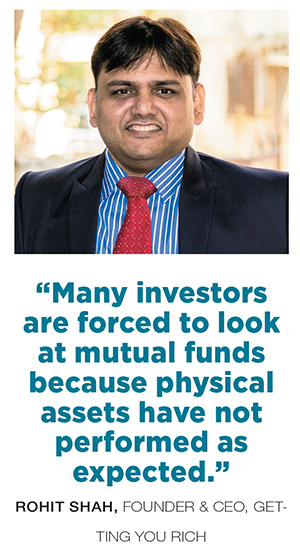 The perception of MFs itself changed from being “for the high-end investors to mutual funds being for one and all,” says NS Venkatesh, chief executive, AMFI. Awareness programmes by MFs and digital media, too, have played a part. “Awareness creation was extremely high and the number of activities the industry has undertaken in educating people, both through TV and print ads, have helped SIPs grow in size,” adds Balasubramanian. As with any product, consistent communication seems to have made SIPs top-of-the-mind. “It’s all a combination of a good concept, good consistent communication, there was money put behind that communication, and then there was a big wave that supported the MF industry. All this together has come around to create this momentum for SIP. It’s just like any other household product,” says Nilesh Shah, MD, Kotak Mahindra AMC. Except that this household product, a financial product, is not as easy as buying soap. 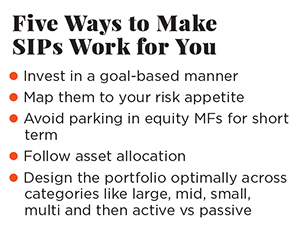 While starting an SIP may be a simple three-four-clicks process, MFs are slightly more complex. “Suppose you are a customer and I am the financial planner and you say I want to invest money. So I would explain to you the concept of asset allocation, then we would come to assets like equity, then we would come to an instrument to ride the growth of equity. Then we would talk about active/passive. Then we would talk about fund manager. Then we would talk about alpha, then about cost-expense ratio, direct plans, regular plans. I think you will simply just prefer to walk down across the road and go to the branch and do the FD,” says Rohit Shah. In the current volatile market scenario, when several MFs have been giving negative one-year returns, he adds that everybody has a complaint, especially those who got into SIPs or MFs in the last two years. “The complaint that ‘my investments have not done well and should I stop them’ means we don’t understand how this product works. Right now maybe it’s because of the fear of missing out that everybody is doing it, everybody is talking about SIPs, but very few people take the pain to get educated,” he says. 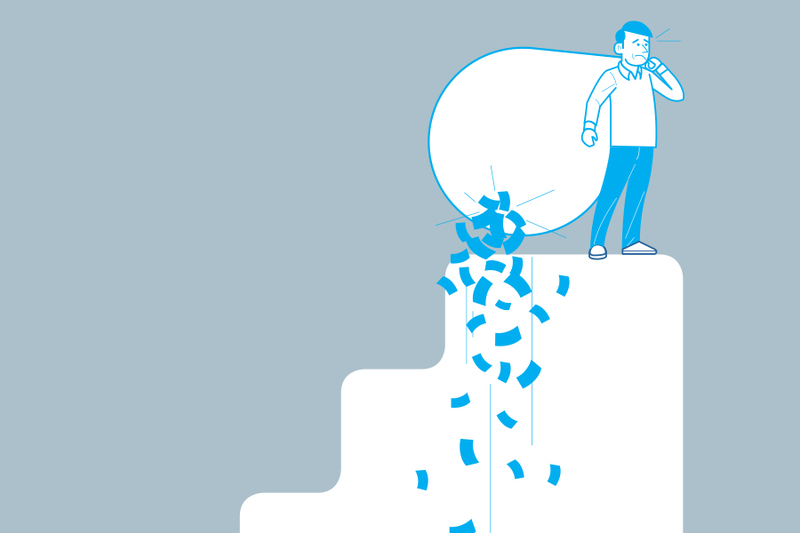 As in any volatile market, the knee-jerk reaction is to cut your losses and pull out, or stop the SIPs through the volatile period, some of the factors that have led to the stagnation of inflows. “What we are seeing is nothing different from what we saw during 2000 or 2008. If investors don’t see returns many of them stop their SIPs,” says Nilesh Shah of Kotak, adding that the SIP closure is far higher among people who invest directly compared to those who invest via distributors. “The distributor community is handholding customers and trying to convince them to continue,” he says. According to fund managers, people invariably end up exiting at the wrong time. When SIP returns are negative, people should invest in markets and continue their SIPs, but fear takes over and pushes investors to stop or cancel their SIPs. And though investors have matured through investment cycles, there is always a new set of investors that panics. “When we say the maturity level has increased, it is on a relative basis. If you look at the last one-year two-year returns, they may not be so encouraging and it’s human nature that you look at the rear-view mirror in terms of what the immediate returns are. To that extent things are myopic, but the net bucket size has increased. It’s only the pace of net additions that has slowed,” says Neelesh Surana, chief investment officer, Mirae Asset Global Investments (India), Pvt Ltd.
After the first phase of adding investors, the industry is now putting in efforts to address the panicked or disgruntled investor situation. The newer campaigns by AMFI ask investors to stay invested comparing it to staying on the pitch during a cricket match to get returns. “When the market is volatile you have to tell the investor that by nature the market is always volatile, and equity as a product is for people with a long-term sort of goal. That’s what we are trying to say, please stay, remain invested if you have a long-term goal. And that will pay you rich dividends. We are trying to sort of calm down their fears, if at all there is a fear,” says Venkatesh of AMFI. Recent regulation changes have also affected the number of folios or new accounts being opened. Though they have been positive on a month-on-month basis, the pace has dropped in the last few months. “Due to all these conditions, people are waiting. Some of the market feedback we have received is also that distributors are trying to rework their distribution model because the commissions have changed,” he adds. Distributors now get commission on a trail basis rather than upfront, which means there are no incentives to churn portfolios and instead they are incentivised to keep investors invested for a longer period. 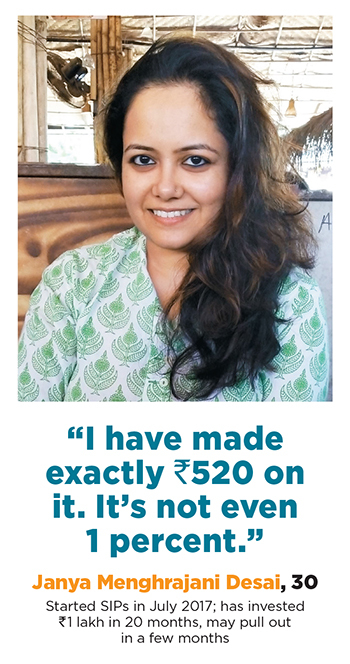 Letting go of the safety of 6 percent on FDs was a leap for Surojeet Mukherjee (name changed), 33, content writer, who, after having heard a lot about the investing tool from peers, started SIPs in January 2018, investing in hybrid equity and debt funds. “I was always in FDs. I got in because of all the hype, and it made sense also to me, at a certain point in time,” he says. But after seeing an erosion of almost a month’s investment on his total, he says he finds himself having to stay put. “They are supposed to be liquid funds, but I find myself notionally locked in since I don’t want to pull out at a loss. Right now I am involuntarily locked in, the situation might improve in a few months and then it might become voluntary,” he says, adding that the messaging of MFs has always been about returns and how they are better than those of other financial products. He adds that though he knows it’s a long-term product, no one really talks of the timeline in the ad campaigns. Both MF managers and financial planners also add that in the heterogenous mix that is India, investors could vary from the very well aware to those who don’t even know the relation of MFs to the stock market. “For all the education, I have people coming to me, saying equity mein daal do, market mein mat dalna,” says Tarun Vohra, founding CEO, Integra Profit. 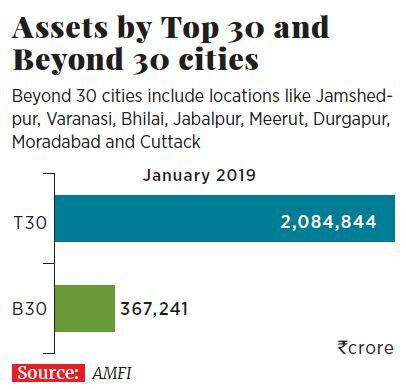 The industry has been making inroads across the country including towns and villages (15 percent of assets in the MF industry came from beyond the top 30 cities in January 2019), and Vohra says the messaging needs to be simpler, clearer and in several languages. “Even if the mutual fund messaging says the word ‘market risks’ I’m sure if you ask 10 people they’ll just say, ‘haan it’s got something to do with the share market business’, they don’t really understand it’s not a linear return. The risk is not the risk of losing capital. Over a five-year or eight-year period, the probability of losing your capital goes down to zero…in year five. It’s just the lumpiness of that return, you never stick around long enough to get the benefit,” Vohra adds. 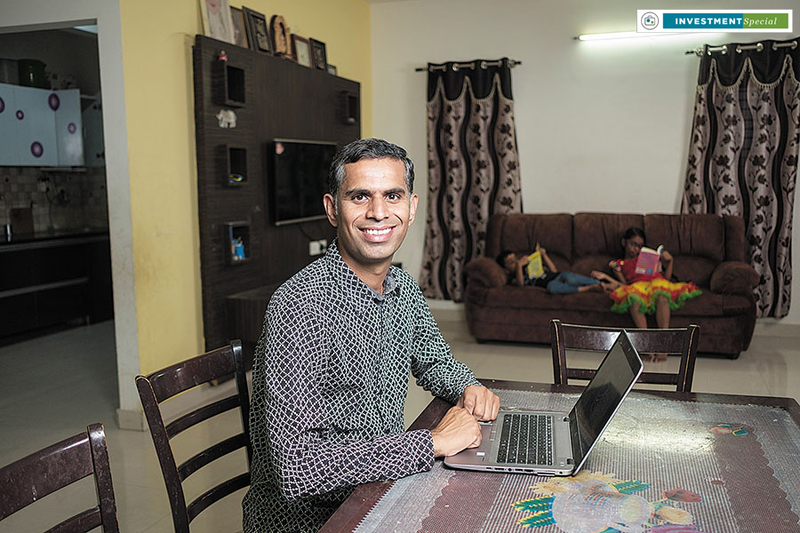 Bengaluru-based senior software architect Sivaram Varanasi, 39, is in for the long haul. He has been investing in the stock market for years, but when he got busy recently with work and family commitments, he decided to go with passive investing. “I’m still active in the stock market, but I got busy with my work. And I thought I might miss the bus so I started using mutual funds to invest passively, though I still have my own portfolio,” says Varanasi who started SIPs in January 2015 and puts about 45 to 50 percent of his income into SIPs and about 10 percent into his personal portfolio, and has set his first goal for around 2028. Rahul Tendulkar (name changed), 40, educational administrator, too has learnt the long-term lesson. When he first invested through SIPs in 2008, he pulled out in panic and “due to inexperience”, he says. Since then he has started SIPs for various goals keeping in mind the capital and gain. His down payment for a house in Bengaluru came from the returns of an SIP and other long-term goals include his daughter’s education. A short-term goal for a holiday has, however, gone for a toss considering the performance of the market last year. Varanasi is making the most of the downturn. “Whenever the market goes down I will be happy because I am still earning from my job. If the market goes down in 2030 I will be worried, because at that time I don’t know if I will have a job or not. But right now I have the capability to earn money through other sources, so whenever the market goes down I will be happy as I can push more money in,” says Varanasi who has seen the 2008 big crash and “then intermediate and small crashes” and is optimistic about the Indian economy and growth story. Fund managers say you have to invest in the market at every level, up as well as down, that you have to invest over a longer period of time and then, if economic growth is there, hopefully market cap will grow correspondingly. Data, they add, shows that SIP value averaging over the years has stood the test of time and has created wealth for investors. “We have been fairly straightforward in telling that it’s difficult to predict the market and we have no ability to understand where markets will be in the short-term. Which is where we recommend you asset allocation in SIP,” says Kotak’s Shah.